JUBA, South Sudan - One year after South Sudan briefly declared a famine, more than half of the people in the world's youngest nation face extreme hunger amid civil war and famine could return, a new report says. More than six million people, up about 40 per cent from a year ago, are at threat without aid, according to the report released Monday by the United Nations and South Sudan's government. It says 150,000 people in 11 counties in Jonglei, Upper Nile, Unity and Western Bahr el Ghazal states could slip into famine this year. "These are unprecedented levels of food insecurity," Ross Smith, senior program officer for the UN's World Food Program, told The Associated Press. He said a political solution in South Sudan is needed so that its people can rebuild their lives. Five years of fighting have devastated the East African nation. Tens of thousands of people have been killed and more than two million have fled the country. A year ago South Sudan declared famine in two counties where 100,000 people faced starvation. After a rapid aid response, further crisis was averted and the famine declaration was lifted in June. "The situation is extremely fragile, and we are close to seeing another famine," said Serge Tissot, representative of the UN's Food and Agriculture Organization in South Sudan. "The projections are stark. If we ignore them, we'll be faced with a growing tragedy." One in three people in South Sudan have been forced from their homes by the civil war, resulting in the worst production of the country's staple grains since the conflict began in late 2013, the FAO said. While supportive of the aid response, South Sudan's government worries that it is crippling the nation. "If a country relies on aid it'll develop a dependency syndrome," said Hussein Mar Nyot, minister of humanitarian affairs and disaster management. People will forget their skills the longer they aren't able to cultivate the land, he said. "I just move from one place to another looking for food," one resident, Chol Makuey, told the AP in one of the worst-affected areas, Ayod County, in December. Cradling her severely malnourished 1-year-old daughter, Makuey said the fighting has prevented her from farming, instead forcing her to wander through villages begging friends and family to share their rations. Aid workers warn that if the situation persists, even with food aid, more than 30 counties in South Sudan could face severe hunger by May, requiring large-scale assistance. The UN humanitarian response plan for South Sudan has received less than 4 per cent of its funding for 2018, with a gap of more than $1.7 billion. Last year President Salva Kiir ordered unrestricted access for aid groups, but aid workers say the situation hasn't changed and the current dry season could make it worse. 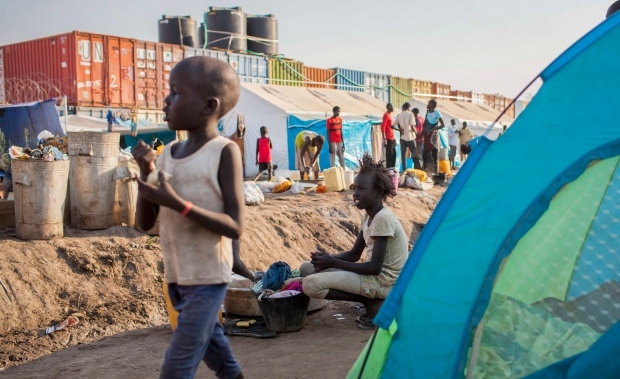 "Continued human rights violations, including blocking of civilian access to food by both the government and opposition forces, have led to severe food insecurity," said Alicia Luedke, South Sudan researcher for Amnesty International.